DOMESTIC RENTAL PRICES levelled off in the second quarter of 2011, according to the latest quarterly report published by Daft.ie this morning. The report, which deals with the months between April and June, showed that rental prices in Dublin and Galway had stayed broadly static in the last year, though they had fallen in Waterford and Limerick – by around 2 per cent in each case – and risen by 4.7 per cent in Cork. The average two-bedroom dwelling will now cost €1,107 per month in Dublin city centre, compared to €837 in the centre of Galway and €785 in the centre of Cork. The same accommodation would cost €573 per month in Limerick, and €551 in Waterford. 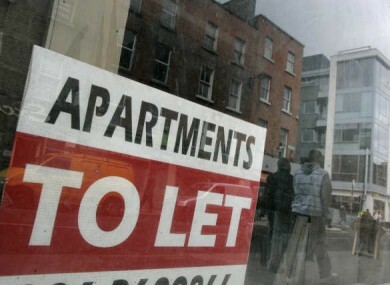 Daft.ie’s data showed that the average rental price had now fallen by a little over 25 per cent from its 2007 average. Rental prices hit a peak in February 2008, shortly before the collapse in the property market. Economist Ronan Lyons said recent reports demonstrated how there was a “strong relationship between the number of properties available on the market, and trends in rents. “The total number of properties available to rent at any one time in Ireland’s five major cities rose from 6,000 on May 1st to 8,000 at the start of August,” he commented. The report will make particularly interesting reading for outgoing Leaving Cert students hoping to attend a third-level institution away from home next month. It found that rental prices for rooms near many colleges had fallen in the last year, with students enrolling in Trinity, DIT, GMIT, Waterford IT, Sligo IT and NUI Galway all benefiting from lower asking prices than at this time last year. Students enrolling in the University of Limerick (up by 8.7 per cent) and IT Letterkenny (up by 7.3 per cent) will fare less well, however. UCD Students’ Union welfare officer Rachel Breslin said the increase in rental prices was ‘almost ironic’ given how students would now have to live farther away from their colleges in order to qualify for the highest rate of college grants. The most recent Daft.ie sales report showed that the average asking price for a house had fallen under €200,000 – having lost over half of its value since the peak in the property market. Daft.ie is part of the Distilled Media group.Journal Media Ltd has shareholders – Brian and Eamonn Fallon – in common with Distilled Media Group. Email “Rental prices levelling off across Ireland – report”. Feedback on “Rental prices levelling off across Ireland – report”.